I think its the ds-300 stop and go that I have...not going outside to look right now. anyhow sometimes the beep for fast lap gets stuck on. It happened ten times in a row today! What could I do to disable the speaker? Should I remove a wire from the speaker? or put in an on/off switch for the speaker because I pressed the button and the sound went off and I waited a few laps and pressed the button again and it got stuck again. Could the speaker be switched with a light if the tones are required for programing the different modes? I would need more info if you want my help. How are you powering the DS System, what rating on the power supply. Also which stop and go boxes are you using. Are you using a DS Light Bridge? Is the beep from the box or the DS 300System when staying on? Is everything else working correctly. Last edited by Scaleracing; 05-28-2013, 05:48 AM. I had a similar issue with some race management software, and my problem was caused by a misconfiguration for 1-lap races. I'm using the ds light bridge,power supply is seperate from the track, belive it is no more than12v. I dont know what stop and go boxes I am using(I'll ask tony),everything else works great and it counts laps just fine when the beep is stuck on. what do you mean by the ds 300 system? the beep is from the master and slave box that has the buttons on top. Rating on the Power Supply running the DS System. Also it is critical you are running the correct Control Boxes, or that will cause problems. If this is a DS 300 system the DS-0021 or DS-0061 work but not if your running an earlier DS Lap Counter. I am out of town this weekend otherwise call me if you want to speed up the process. Also the beep is coming only from the DS-300 or is also coming from the DS-334 to test run only the DS 300 and see if the problem still happens. Do both Control boxes make this happe or only one of them? 12v power for all the boxes and light bridge,with variable for track lane power. I dont know about the rest. What is the amperage rating of the power supply running the ds system? I dont know what was going on!? I've used it during several different weather conditions, and voltage settings on the track,mag and no mag. I think it was humidity?! Because it has not had the same conditions since then....it probably wont work wed night. ....it probably wont work wed night. If you think it's humidity, some silica gel placed under the unit may help, but I do not think that is likely to be the problem. Mag, no mag will not be it either nor Track voltage unless the DS is powered from the same supply. The DS units should not be powered up at over 12 volts, the spec is 10-12 volts 3 amps for the Timer!! I have tried to help but without communication I can do no more. Does the DS unit have this issue without the stop and go boxes attached, can you replicate it or is it random. Happy to exchange the unit, but it could be the DS-0061, it could be either of the DS 300 or DS334 units. It is possible it is also in the wiring. Plus if you are using Race Manager it could be that connection that kicks off the beep. Happy to get to the bottom of this with you, but from a distance it is not achievable. Either test each unit separately and let me know, or make an appointment and come by the Store when I can be their to test all the parts for you. In anticipation of eventually assembling my 3 lane Scalex track into a permanent layout, a couple years ago I downloaded PC Lapcounter and bought a couple DS300's to use as sensor. 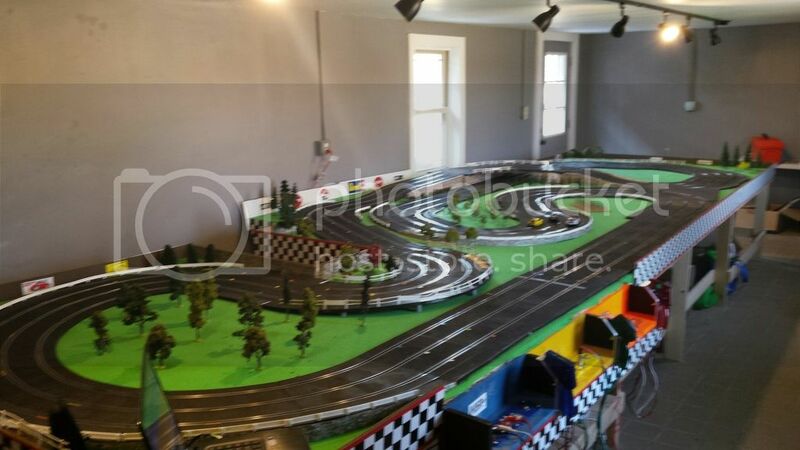 The track is now up and running, and soon will be hosting some events after it goes through some shakedown activities. Have noticed a couple of times, while running races, the beeper on the DS300 comes on on stays on. I can't say that I've mastered these devices. They are kind of tricky to get to know. About all I've mastered so far is setting the lap #'s to 9999 and hitting 'go.' Which seems to work. Any suggestions as to what triggers the beeper to come on and stay on, going off only when basically resetting the unit? I've looked at the manual...wow. I don't know if it's age or advancing brain fog, but sifting through it will require a lot more attention than I've been able to give it so far...so if anyone has a quick/easy answer for why the beeper stays on, would love to hear it. Otherwise I'll need to force myself to decipher the manual. No stop/go boxes used (not compatible with PC Lapcounter). Last edited by tlbrace; 02-20-2017, 08:12 AM.